We provide 5 lentic mesocosm systems (ponds) with a capacity of 110 mesocosms and 1 lotic mesocosm system (stream) with 16 mesocosms. A high diversity and sound abundances of a broad range of aquatic species. The facility is surrounded by a buffer zone of meadows - no contamination by agriculture. 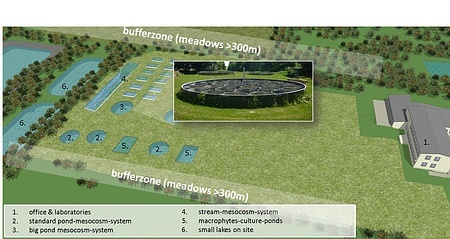 The source of sediment and water (naturalized ponds) of the mesocosms is located at the test facility - best conditions for recolonisation.